Marisa Pavan walks a bike, goo-goo eyed. 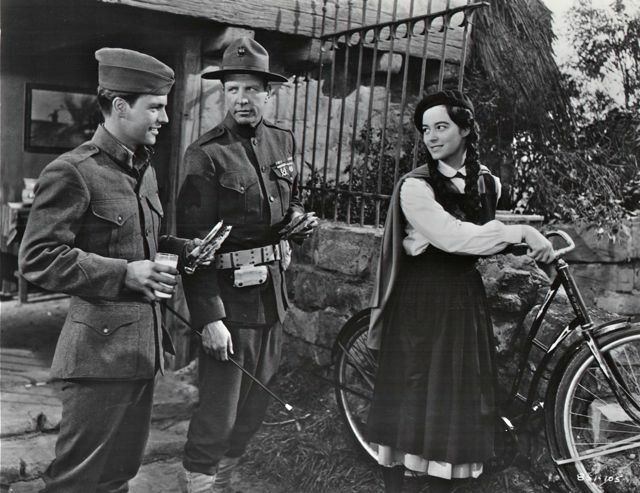 Marisa Pavan, playing a farmer’s daughter in World War I France, makes goo-goo eyes at Robert Wagner, in the role of a lovestruck Army private. Dan Dailey, as the sergeant, looks on in this still from John Ford’s 1952 Technicolor war pic, What Price Glory. The Twentieth Century Fox film marked Pavan’s screen debut — she is Pier Angeli’s twin sister, and was married to the French star Jean-Pierre Aumont until his death in 2001.